As William Morris, the founder of the Society for the Protection of Ancient Buildings (SPAB) puts it, ‘stave off decay by daily care’. It is the idea that expensive major works can be avoided if we are thorough with inexpensive regular maintenance. West Access Conservation and their craftsman have surveyed and conserved ancient and historic buildings for more than 25 years. We well understand the on-going battle between the prevailing weather and the church fabric and we deal with the consequences on a daily basis. The rainwater goods and coverings are the crucial first line of defence against the elements. If they are given proper consideration and regular attention then they will stem the erosion of the underlying fabric. We are also a company that specialise in difficult and high-level access which makes us well placed to deal with church eaves / roof valleys and tower parapets & downpipes. We have therefore decided to offer a maintenance service specifically tailored to ecclesiastical and historic buildings. 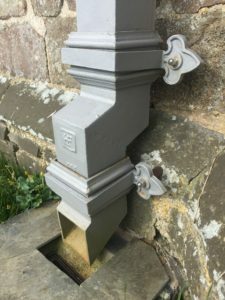 Despite the similar design, we understand that every church will have a unique maintenance requirement and require a bespoke service. Main Church: Clean out eaves, parapets and valley gutters, clean leaded roofs, clean rainwater hoppers/sumps, collect and dispose of debris. Ground Drainage: Clean out rainwater gullies, ground gutters, catch pits, inspection chambers connected to rainwater systems. Open, clean and reseal rodding eyes. On completion of each visit, we would produce a report in electronic format detailing any missing/broken roof tiles, slates or other roof coverings, loose/missing flaunchings & flashings, broken/loose/missing eaves, fascia boards, soffits, rainwater goods.